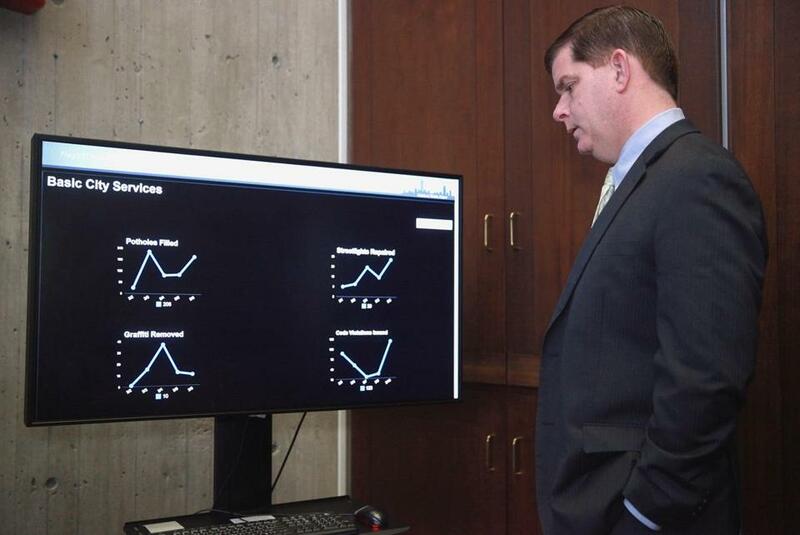 Mayor Walsh can keep tabs on city life by consulting two data dashboards in his office that let him see statistics on services such as school bus arrival times and hot line calls. There was a time — the past 20 years, actually — when two large computer monitors in the mayor’s office would have been as welcome as a Walmart executive pitching a store in Boston. Longtime occupant Thomas M. Menino famously shunned e-mail and didn’t even allow a PC to clutter his desk. Now it’s more like Mayor’s Office version 2.0, as evidenced by the two 46-inch screens, called dashboards, that sit atop metal stands. They display data about all things Boston — from the percentage of school buses arriving on schedule to how many potholes were filled in the past week to the number of calls flooding the city’s 24-hour hot line (556 on a recent day, with an average answer time of 8 seconds). The idea is to give the new mayor, Martin J. Walsh, a snapshot of how things are running at any given moment, and to show him how well government employees are doing their jobs. “It’s really a way to have the department heads push to deliver better services to the city of Boston,” Walsh said. The technology behind the dashboards isn’t exactly new. For years, Boston and other cities across the United States have been poring through information related to such areas as crime, traffic, and potholes, looking for patterns that would help provide better or more efficient services. Urban managers — and corporate executives — have embraced the use of so-called big data to track performance, improve efficiency, and gain new insights. But by flowing all that data onto two screens in the mayor’s office — sending it directly to the top of the chain of command — it is possible for him to discern the pulse of daily life in the city, and to figure out what is or isn’t working. And while some might find the concentration of information overwhelming, Walsh finds it helpful. “You learn to focus on certain things,” he said. For instance, Walsh said, if he notices calls to the hot line escalating, an aide will check to find out if anything out of the ordinary is happening. The screens also show social media analysis, so Walsh can gauge the sentiment of online conversation about Boston. While he doesn’t follow Twitter “all day,” he does tweet from time to time, and has even hosted a Facebook Q&A. He also plans to make use of video conferencing equipment newly-installed by his staff. It’s a lot of technology for someone who admitted during last year’s campaign that he wasn’t a “big high-tech person,” but Walsh, 46, appears to be a fast learner. He borrowed the dashboard idea from one of the most data-driven mayors in the country, Michael Bloomberg. During his 12 year tenure as the top elected official in New York City, Bloomberg pushed his staff to find innovative ways to analyze a dizzying amount of data being collected from all parts of the city. The aim was to use computers to discover previously overlooked issues and find solutions to ones that had long proved frustrating. In one case, New York officials analyzed building data to determine which were more susceptible to fires, and then dispatched inspectors to those properties. Boston has undertaken similar efforts to target negligent landlords and to cut down on traffic congestion. For city managers and planners, this is becoming a golden age of data, said Katharine Frase, chief technology officer of IBM’s Global Public Sector, which works with many cities to find new ways that technology can improve services. The answer, Frase said, is in the improved software that has become available in recent years. It’s capable of making sense of the ever-expanding oceans of digital information that flow from standard computers, smartphones, and even street lights and trash cans equipped with sensors. In the past, valuable information might have just clogged hard drives. Today, computers can crunch data to spot troublesome traffic spots, or suggest where problems could occur in the future — something called predictive analytics. “They allow a city to begin to make policy and implement interventions on a proactive rather than purely reactive basis,” said Charlie Catlett, director of the Urban Center for Computation and Data in Chicago. Several cities are already using predictive data tools that have the potential to pinpoint crime flare-ups eight to 12 hours in advance, said Catlett. To some, that kind of technology might conjure unsettling images from the 2002 Steven Spielberg sci-fi film “Minority Report,” in which police arrested people who were about to commit crimes. Nothing quite so futuristic is taking place in Walsh’s office — the dashboards aren’t predicting what will happen next. But Justin Holmes, Boston’s interim chief information officer, said they do get people thinking about what to do next in a growing city.